Mikrotik router kullanarak kendi 6to4 tunel yapilandirmam ile datacenterdaki native ipv6 networkum uzerinden evde ipv6 kullanma deneyimim. bu yazi basligi cok uzun oldu biliyorum. Ancak bu konu ile ilgili bir suredir dusunmekte idim. Kendi evimde kablonet uzerinden sabit ip adresimle he.net tunnel broker servisini kullarak uzun zamandir ipv6 kullanabilmekteydim. Mikrotik ile bu isin nasil yapilacagi konusunda zaten 1 milyon tane dokumantasyon howto vb var. Ancak benim yapmak istedigim verimerkezinde bulunan mikrotik routerimda hali hazirda bulunan native ipv6 baglantisi ve o lokasyonda anons ettigim /32 ipv6 icinden kendi evimde ipv6 kullanmak idi. aslinda yapilmasi gerekenler cok basitmis. ben konuyu bos yere karmasik hale getiriyormusum. adim adim yazayim belki yapmak isteyen bir baskasi olursa faydasi olsun. Verimerkezinde bir mikrotik routerim var. Bu router ile direk native olarak ipv6 internete cikabiliyorum. 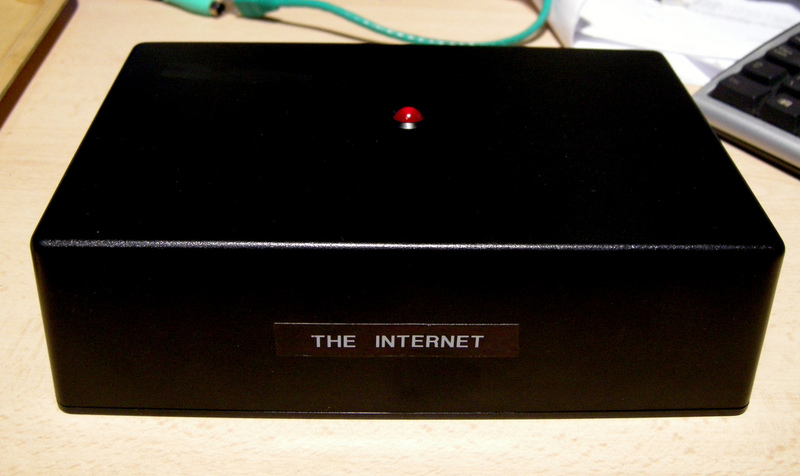 Bu router uzerinde anons ettigim /32 ipv6 adres blogum var. Tum nat, dhcp ve benzeri isleri kablonet modem arkasindaki mikrotik routerim hallediyor. Kablonet firmasindan sabit ipv4 ip adresim var. Ve bunu kullanarak internete cikiyorum mikrotik routerim uzerinden. Verimerkezindeki /32 ipv6 blogumdan bir /48 ipv6 blogunu evimde kullanmak istiyorum. Bu sayede evimde ipv6 baglantim olmus olacak. Direk yurt icindeki, hatta ayni sehirdeki verimerkezi uzerinden cikacagim icin dusuk ping ile ipv6 internete ulasabilir durumda olacagim. 3- E PEKI HE.NET ? TUNNELBROKER ? ipv6 he.net tunnelbroker ile uzun zamandir evde kullaniyorum. ipv6 zaten var evimde yani. Frankfurt uzerinden yaptigim v6 tunel yaklasik 80ms overhead koyuyor ping surelerine. ip adresin he.net almanya gozuktugunden ipv6 internetinde mesela facebook’a girerken veya youtube’a girerken beni Alman zannediyor. 4- PEKI NASIL YAPTIN SONUNDA? HADI ARTIK LAF SALATASINI KES! BU KADAR 🙂 Ne kadar kolay degilmi 🙂 6to4 tunelimiz kuruldu. su anda fe80 ile baslayan verimerkezindeki v6 ip adresimizi evden pingleyebilir durumdayiz. 5- Verimerkezindeki mikrotik router uzerinden devam: /48 tanimlayalim. verimerkezindeki anons ettigim ipv6 adres blogum 2a02:800::/32 oldugundan yola cikarak. prefixmimiz icin default gateway ve unreachable route cunku, paketler routerlar arasinda luzumsuz bounce etmesin. tamam? Asagida Advertise secili olacak kutucuk . Ki mikrotik arkasindaki lokal agimizdaki cihazlar bu blok uzerinden ipv6 larini alsinlar doya doya. tebrikler. Artik evinizde ipv6 var. NOT: ND nedir /48 nedir /32 Nedir ? Route ipv6 falan? Ha? tabi azicik ne ile ugrastiginizi biliyor olmaniz gerekiyor dogal olarak. en hizli rsync nasil yapilir? adresinden yola cikarak yapilir evet. buunu birde boyle denemek mi lazim acaba? en krali bu tamam ya bu is ..
bir daha yazalim mi ? NOT: dogal olarak bunu ALICI makinada calistiriyoruz. Centos 5 coktan EOL oldu. ama inatla yuksetlmek istenilmeyen sunucular var. en azindan final 5.11 devam edersin. tabi yukseltmek gerek eninde sonunda. Bu konu hakkinda daha once yazmistim. mesela .link bloklamak istiyorsun linkedin den gelen mailleride blokluyor. # THESE BLOCK MORE SPAM THAN ALL THE OTHER RULES COMBINED! headers add "SpamRule: EXIM FILTER Block Newfangled Domains (was: $h_subject:)"
You can omit the “headers add” line and the “deliver” line to just delete them if you dare. bu satirlar kontrol icin , yiyorsa toptan sil 2 satiri demis. This command shows us all running processes that are using port 80 for any kind of communication. The -i parameter specifies we want to list the processes, by identifying them with IPv4 or IPv6. The tcp:80 part means we only want to show TCP connections (and ignore UDP for the time being) using port 80. Using -P we specify we want to see the port numbers (80, 21, …) instead of the names (HTTP, FTP) which are shown by default. Much like the -n parameter with netstat. With -R we also show the Parent Process ID, to see who initiated this process. HTTP proxy setup with SSL support. reboot The machine will restart. The Internet // Internet Nedir? Gecen gun gene lazim oldu. Question: On CentOS 7, I want to switch from DHCP to static IP address configuration with one of my network interfaces. What is a proper way to assign a static IP address to a network interface permanently on CentOS or RHEL 7? 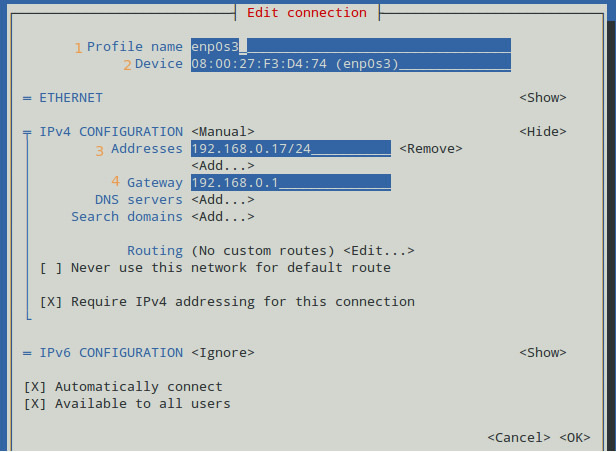 If you want to set up a static IP address on a network interface in CentOS 7, there are several different ways to do it, varying depending on whether or not you want to use Network Manager for that. Network Manager is a dynamic network control and configuration system that attempts to keep network devices and connections up and active when they are available). CentOS/RHEL 7 comes with Network Manager service installed and enabled by default. If the output of nmcli shows “connected” for a particular interface (e.g., enp0s3 in the example), it means that the interface is managed by Network Manager. You can easily disable Network Manager for a particular interface, so that you can configure it on your own for a static IP address. 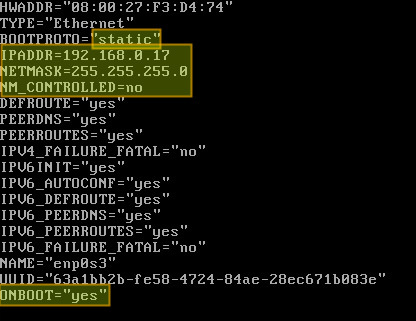 Here are two different ways to assign a static IP address to a network interface on CentOS 7. We will be configuring a network interface named enp0s3. Go to the /etc/sysconfig/network-scripts directory, and locate its configuration file (ifcfg-enp0s3). Create it if not found. In the above, “NM_CONTROLLED=no” indicates that this interface will be set up using this configuration file, instead of being managed by Network Manager service. “ONBOOT=yes” tells the system to bring up the interface during boot. If you want to use Network Manager to manage the interface, you can use nmtui (Network Manager Text User Interface) which provides a way to configure Network Manager in a terminal environment. Before using nmtui, first set “NM_CONTROLLED=yes” in /etc/sysconfig/network-scripts/ifcfg-enp0s3. Now let’s install nmtui as follows. The following screen will allow us to manually enter the same information that is contained in /etc/sysconfig/network-scripts/ifcfg-enp0s3.